Our medical director is Diogenes F. Duarte, MD; Dr. Duarte completed medical school at Universidad Nordestana (UCNE) in his native Dominican Republic in 1987; after working on preventive and primary care medicine for 2 years, he underwent 4 years of training in Internal Medicine at Jose Maria Cabral and Salvador B. Gautier Hospitals until 1993; he then started to work as Internist at the latter hospital and also served as physician and 2nd luthenant for the dominican air force as well as teacher of medicine for 3 medical schools in the Dominican Republic; in 1997, after passing the required USA medical boards, he decided to migrate to the USA where he trained again in Internal Medicine – this time for 3 years – at Woodhull Medical Center in Brooklyn, NY. Dr. Duarte always loved taking care of critically ill patients with respiratory and multi-organ problems in the intensive care unit (ICU) and decided to pursue further training; he was accepted at University of New Mexico in 2000 and completed 3 years of training in Pulmonary and Critical Care Medicine; while in training, he started to learn about Sleep Medicine and decided to pursue even further training completing a Sleep Medicine Fellowship in December 2003. 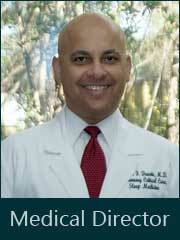 Upon completion of his training, Dr. Duarte worked in South Florida for approximately 1 year; he and his wife Theresa then decided to look for a smaller community to raise their children and they moved to Lake City in June 2005 where Dr. Duarte established his practice and where he has proudly served the community to today. Dr. Duarte is currently certified by the American Board of Medical Specialties (ABMS) in Internal Medicine, Pulmonary Medicine, Critical Care Medicine and Sleep Medicine and is also certified by the American Board of Sleep Medicine (ABSM) in Sleep Medicine. Dr. Duarte has been married to Theresa since 1995 and is a proud father of four children: Lisaine, Jack, Eliana and Natalia; besides enjoying time with family, Dr. Duarte loves sports – primarily baseball – and music.